The California Subjective Crop Estimate for 2018 is estimated at 2.3 Billion Pounds. posted by: Chris Wilding date: May 10, 2018 category: Latest News comments: Comments Off on The California Subjective Crop Estimate for 2018 is estimated at 2.3 Billion Pounds. Forecasted production is 1.3 percent above last year’s production of 2.27 billion pounds. Forecasted bearing acreage for 2018 is 1,070,000. Forecasted yield is 2,150 pounds per acre, down 5.3 percent from the 2017 yield of 2,270 pounds per acre. The subjective production forecast is based on a telephone survey conducted from April 18 to May 4 from a sample of almond growers. 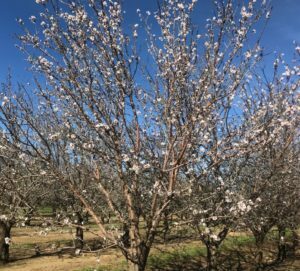 The 2018 California almond bloom began a few days earlier than normal. The bloom period was extended, due to cold temperatures, and lasted a few weeks. Frosts during bloom hit orchards hard, especially on the east side of the valley. Younger trees were impacted more severely than older trees. Weather during the spring was variable, leading many growers to be unsure about their 2018 crop. As temperatures warmed up in May, nuts were sizing well. On Friday the California Almond Board will announce the April Shipment Report as well.